Washington Square East, Left Or Right Onto Briggs Street. Juniper Point Investment Companys newest & finest transformed Condominium renovation in highly acclaimed, Historic Salem Common Area. Easy walk to T stop, Common, Pickering Wharf, Downtown & Beach. Easy to see this is not your typical conversion. Sophisticated 2-unit bldg, 1 unit SOLD...1 unit left. 2137+- sq ft townhouse, private entrance on 4 levels. 6 rooms, 3 bedrooms, 2 bthrms, a/c, priv. 13x7 deck, patio & 2 car pkg. Master bdrm (17x12), oak floors, huge walk-in closet, vaulted ceiling, recessed lights, plenty of natural light & distant Harbor Views. The detail in the spacious en-suite bathroom will impress you: over-sized soaking tub, top-end marble shower & custom quartz double sink. Dashing fully applianced, high-end kitchen w/ granite breakfast bar. 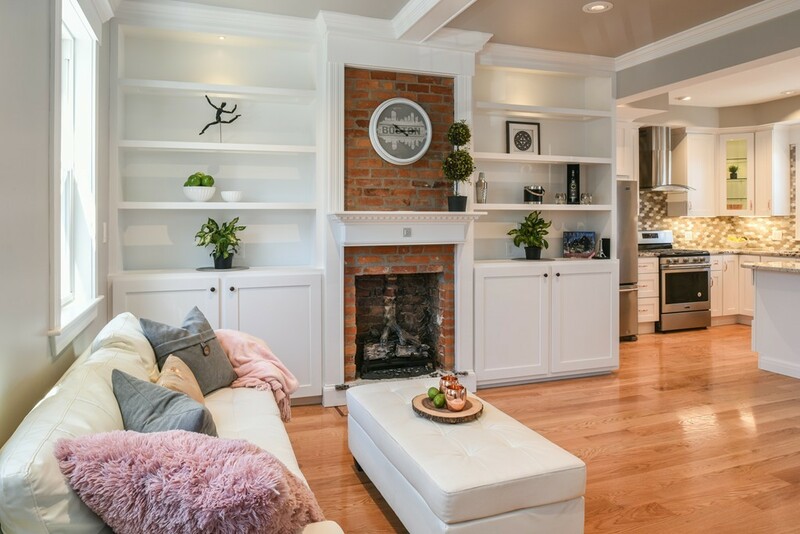 Living room with custom built-in hutches, glass shelves, recessed lights exposed brick, electric fire place & coffered ceiling. 19x17 fam rm in lower level. Pets are OK.